Let us find jobs for you based on your LinkedIn profile. At Famous Footwear, our shoes empower us to step forward and become our best selves. When we are inspired to be our best, our potential is limitless. Make the next step in your retail career with Famous Footwear. 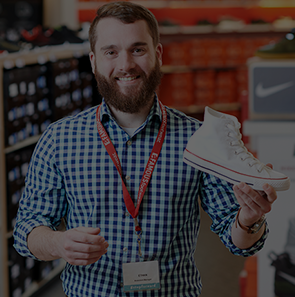 Joining our team as a Sales Associate is your first step forward in a career with Famous Footwear! Famous Footwear is a retail division of Caleres, a $2.6 billion footwear company with a diverse portfolio of global footwear brands, which fit people’s lives. We offer competitive pay, career advancement opportunities and a 30% shoe discount. Apply today! We will email you when new jobs are posted. Caleres, Inc. is an Equal Opportunity Employer and Affirmative Action Employer of minorities, women, individuals with disabilities and protected veterans.